Sometimes, you just have a hunch. As I drove down the street a few weeks ago in search of empanadas, I passed a new addition to this restaurant-packed stretch of Westchester Ave. It’s in the same location two other restaurants have occupied in just the last year. But something about that spiffy new blue awning told me it would be great. 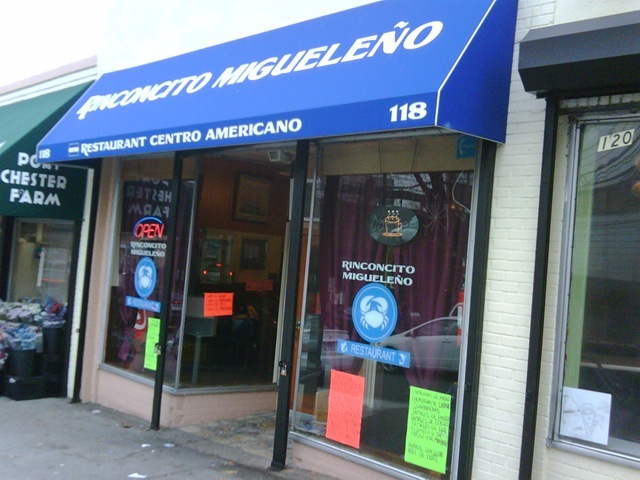 After my taquito experience a few days ago, I took the opportunity to walk down the street and scout the blue awning restaurant – Rinconcito Migueleño – more properly. Grabbing a card, I vowed to return as soon as I could. So today I made my way back, nestled into my seat and took a long look at their short menu. Migueleño is a Salvadoran-Guatemalan restaurant though the menu feels more of the former than the latter. As tacos are the quality benchmark for any Mexican taqueria, pupusas are my benchmark for any Salvadoran restaurant. So I ordered two pupusas – queso con loroco and chicharrón. I threw in a chorizo taco to check out the Guatemalan side of the menu. The pupusas were fantastic. They had a mildly crisp exterior, not tough, heavy, chewy or greasy – the usual culprits in a sub-par pupusa. The interior was soft with a strong masa flavor. The queso con loroco pupusa is comfort food at its best: a half-inch thick masa tortilla filled with hot stringy cheese punctuated with the herby loroco. The chicharrón pupusa was equally satisfying. The vinegary slaw and tomato sauce/salsa that accompanied the pupusas were perfect too. providing the requisite sharpness to cut the richness of the pupusas. All in all, these were the best pupusas I’ve had anywhere around these parts – and every bit on par with the great ones I had from some of the pupuserias in San Francisco’s Mission District a few weeks ago. Needless to say, this beats its Port Chester Salvadoran neighbors – Rinconcito Salvadoreño, El Tesoro II and Pupusa Loco – hands down. The taco, on the other hand, was a disappointment. My favorite part about Guatemalan tacos is that they are usually thick, hand made tortillas. But Migueleño’s were made with standard Mexican tortillas. And while the chorizo filling is distinctly different from a Mexican chorizo, it’s just not worth going there when the pupusas are so good and you can get truly outstanding tacos only a few doors up the road. All told, the pupusas will set you back $1.50 each, and the tacos another $2.50 each. The best bet is to get the $6.50 special, which comes with 2 pupusas, beans and plantains. Umm, I’ve never had a pupusa before, but now I HAVE to have one from the place with the little blue awning. YUM! I believe that it is hard to find decent mexican food on the east coast. We were spoiled growing up in CA!